Among more than 10,117,500 names registered under new gTLDs, the leader continues to be .XYZ with over 1,628,700 registrations, according to ntldstats.com. That constitutes about 16.1 % of all domain names. 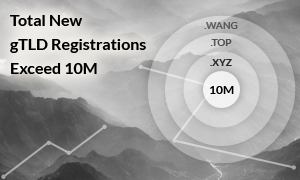 The .TOP domain comes in second on the list with 890,500 registrations, followed by .WANG with about 592,000 registrations at the time of writing this. There are also eight new gTLDs with over 100,000 registrations: .CLUB, .SCIENCE, .PARTY, .LINK, .CLICK, .REN, .WEBSITE, and .REALTOR, .ONLINE and .DATE. If you are looking for an innovative way to mark your presence online, please consider registering your perfect domain name within one or more of the new gTLDs. They offer more naming choices and are a definitive alternative to .COM, .NET or .ORG. You can also opt for a country code domain. Please feel free to use our search tool to check if the name you are looking for is available. If you need assistance, please contact us at support@web-solutions.eu or by phone on +44 (0) 208 133 3994.